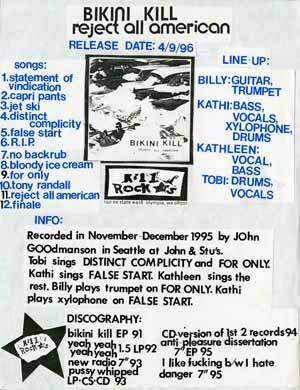 Images from the Gayle Wald Riot Grrrl Collection and the Kill Rock Stars Collection file on Bikini Kill. All our audio on Riot Grrrl can be found here. Heavens to Betsy: Corin Tucker (guitar, vocals, drums) and Tracy Sawyer (drums, bass, guitar, screams). Recorded in Seattle, Nov. 30-Dec. 3, 1993. 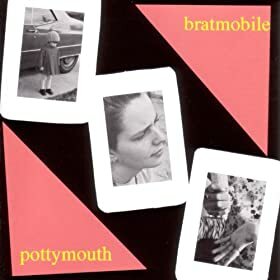 Bratmobile: Allison Wolfe (vocals), Erin Smith (guitar), Molly Neuman (drums). Recorded July 1992 at the Embassy W.D.C., or Aug. 1991 at Egg Studios, Seattle, and YoYo Studios, Olympia, Washington. Bikini Kill: Kathi Wilcox (bass), Billy Karren (guitar), Tobi Vail (drums), Kathleen Hanna (vocals). Recorded at AVAST! Studios, Seattle, Wash., Oct. 1992. 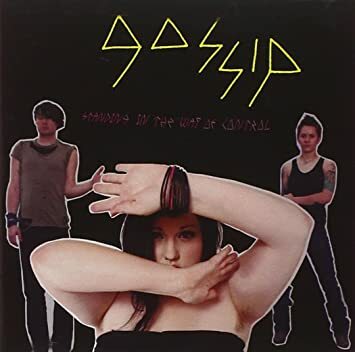 Gossip: Beth (vocals), Brace (guitar), Hannah (drums). Recorded at Bear Creek Studios, 2005. All our video on Riot Grrrl can be found here. These interviews tackle the past 30 years of female involvement in DIY music, and aim to give a more complete picture of how women have participated in the DIY community and how it affects their daily lives. 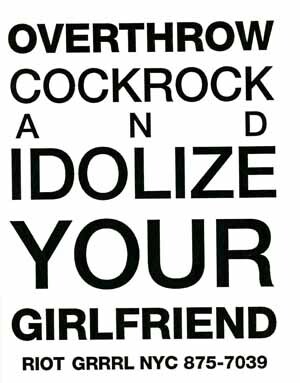 All of our books on Riot Grrrl can be found here. Weaving personal anecdotes with interviews with key players such as Tobi Vail from Bikini Kill and Amy Ray of the Indigo Girls, Meltzer chronicles the legacy of artists including Bratmobile, Sleater-Kinney, Alanis Morissette, Britney Spears, Pink, Avril Lavigne, and, yes, the Spice Girls. Writings from the girl zine revolution. Interweaves research, interviews, and the author's own memories as a Riot Grrrl front-liner. 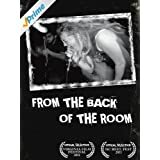 Marcus' passionate, sophisticated narrative brilliantly conveys the story of punk bands like Bikini Kill, Bratmobile, Heavens to Betsy—as well as successors like Sleater-Kinney, Partyline, and Kathleen Hanna’s Le Tigre—and their effect on today’s culture. Vivid account of the third wave told in the voices of those who pioneered the movement, recounting the experiences of the women and girls who refused to remain on the sidelines of cultural production, and through that refusal forever changed the face of feminist resistance. 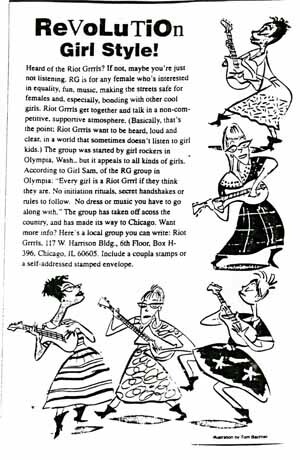 Selection of riot grrrl zines collected by New York University's Fales Library. Print of the album art for Fontanelle and lyrics to "Middle Man." Correspondence, flyers, radio show playlists, stickers, zines, and other miscellaneous materials related to the Riot Grrrl movement in New York City, Chicago, and D.C., specifically the bands Fifth Column and the Lucy Stoners, the WPRB radio show at Princeton "Ladies First," and record label Hide Records and Tapes. 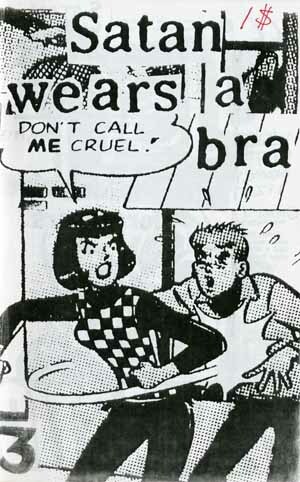 Although the label's music has never reflected just a single genre or underground music movement, it is most notable for releasing the work of various riot grrrl bands during the mid-1990s, including Bikini Kill, Sleater-Kinney, Bratmobile, Huggy Bear, Heavens to Betsy, and Excuse 17. Contains press releases, clippings, photographs, tour dates, radio reports, biographical information, artist proofs, and poster art. Additional Rock Hall materials on Riot Grrrl can be found by searching the catalog for individual artist and band names. 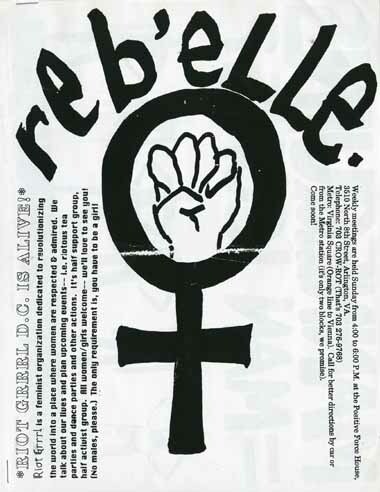 The Fales Library & Special Collection at NYU has the Riot Grrrl Collection, which documents the evolution of the Riot Grrrl movement through the creation of early Riot Grrrl zines, music, and activism, particularly in the years between 1989 and 1996. BECAUSE we are unwilling to falter under claims that we are reactionary "reverse sexists" AND NOT THE TRUEPUNKROCKSOUL-CRUSADERS THAT WE KNOW we really are.